1. Choline plays a key role in liver metabolism and as a methyl donor, enhancing fat export and helping to mitigate the risk for development of fatty liver and ketosis, common concerns for transition cow health. During the transition period cows may experience a negative energy balance, and the related stress can make methyl donor nutrients like choline more important. Especially during periods of negative energy balance, ruminants have limited capacity for hepatic fatty acid oxidation and export of very-low-density lipoprotein, which causes increased uptake of non-esterified fatty acids (NEFA) by the liver, a key factor in development of fatty liver. Choline helps the liver package and export native low-density lipoprotein, thereby supporting liver health. 2. Inclusion of choline in the transition period can benefit milk production. Choline has been observed to benefit milk production in post calving transition cows, especially cows that are a little on the heavy side. This results from improved transport of lipids in the blood. Choline helps the liver package and export native low-density lipoprotein, thereby helping maintain the cow’s capacity for converting ammonia to urea which, in turn, helps the gluconeogenic capacity to form propionate, a predominant glycogenic precursor and key for milk production. Microencapsulation is critical for optimal intestinal release of choline. 3. Inclusion of choline in the transition period can promote fertility. After calving, increased NEFA and beta hydroxyl butyric acid concentrations in the blood can indicate negative energy balance. The addition of choline to facilitate export of fatty acids from the liver can support postpartum health and reproductive performance. 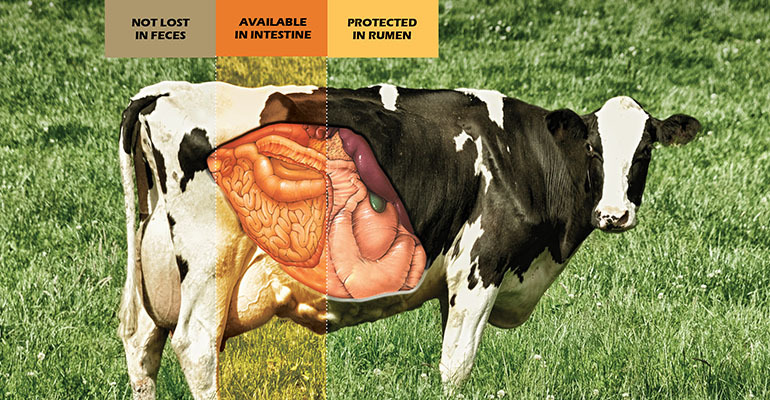 Because rumen microbes digest nearly 100% of the choline chloride in feeds and supplements, dietary choline must be rumen-protected (RP). Encapsulated in a fat matrix, RP choline passes through the rumen to the intestine, where the cow’s enzymes can release choline for absorption. Under-protection will result in the choline being degraded in the rumen and over-protection will result in the choline being lost in the feces. Selecting a RP choline with superior availability in the small intestine is key for managing transition cow health. 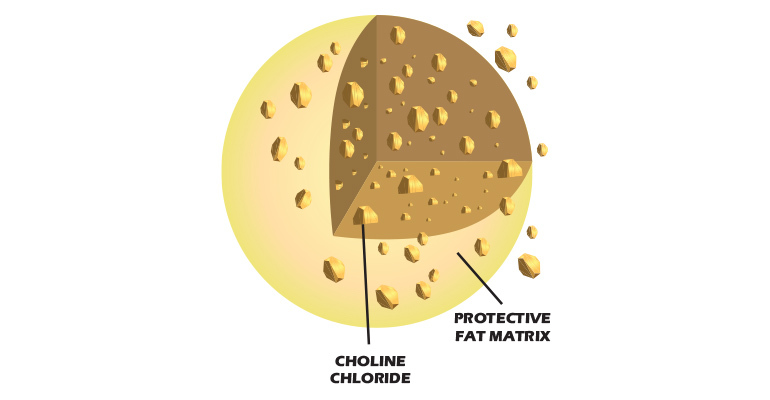 Microencapsulation technology delivers maximum availability of absorbable choline chloride to the small intestine for optimal utilization by the cow. Our Provimi nutritionists recommend supplementation of diets with rumen-protected choline chloride 30 days prior to calving through 90 days after calving.